Read the Mao Zedong article on battle of Stalingrad | Fight Back! To mark the victory of the Soviet Union at Stalingrad, Fight Back News Service is reprinting the following article by Mao Zedong, that was first published October 12, 1942, in Liberation Daily. The Battle of Stalingrad has been compared by the British and American press to the Battle of Verdun, and the "Red Verdun" is now famous all over the world. This comparison is not altogether appropriate. The Battle of Stalingrad is different in nature from the Battle of Verdun in World War I. But they have this in common-- now, as then, many people are misled by the German offensive into thinking that Germany can still win the war. In 1916 the German forces launched several attacks on the French fortress of Verdun, two years before World War I ended in the winter of 1918. The commander-in-chief at Verdun was the German Crown Prince and the forces thrown into the battle were the cream of the German army. The battle was of decisive significance. After the ferocious German assaults failed, the entire German-Austrian-Turkish-Bulgarian bloc had no future, and from then on its difficulties mounted, it was deserted by its followers, it disintegrated, and finally collapsed. But at the time, the Anglo-American-French bloc did not grasp this situation, believing that the German army was still very powerful, and they were unaware of their own approaching victory. Historically, all reactionary forces on the verge of extinction invariably conduct a last desperate struggle against the revolutionary forces, and some revolutionaries are apt to be deluded for a time by this phenomenon of outward strength but inner weakness, failing to grasp the essential fact that the enemy is nearing extinction while they themselves are approaching victory. The rise of the forces of fascism and the war of aggression they have been conducting for some years are precisely the expression of such a last desperate struggle; and in this present war the attack on Stalingrad is the expression of the last desperate struggle of fascism itself. At this turning point in history, too, many people in the world anti-fascist front have been deluded by the ferocious appearance of fascism and have failed to discern its essence. For forty-eight days there raged an unprecedentedly bitter battle, unparalleled in the history of mankind--from August 23, when the entire German force crossed the bend of the River Don and began the all-out attack on Stalingrad, through September 15, when some German units broke into the industrial district in the northwestern section of the city, and right up to October 9, when the Soviet Information Bureau announced that the Red Army had breached the German line of encirclement in that district. Ultimately this battle was won by the Soviet forces. During those forty-eight days, the news of each setback or triumph from that city gripped the hearts of countless millions of people, now bringing them anxiety, now stirring them to elation. This battle is not only the turning point of the Soviet-German war, or even of the present anti-fascist world war, it is the turning point in the history of all mankind. Throughout these forty-eight days, the people of the world watched Stalingrad with even greater concern than they watched Moscow last October. Until his victory on the western front, Hitler seems to have been cautious. When he attacked Poland, when he attacked Norway, when he attacked Holland, Belgium, and France, and when he attacked the Balkans, he concentrated all his strength on one objective at a time, not daring to disperse his attention. After his victory on the western front, he became dizzy with success and attempted to defeat the Soviet Union in three months. He launched an offensive against this huge and powerful socialist country along the whole front stretching from Murmansk in the north to the Crimea in the south, and in so doing dispersed his forces. The failure of his Moscow campaign last October marked the end of the first stage of the Soviet-German war, and Hitler's first strategic plan failed. The Red Army halted the German offensive last year and launched a counteroffensive on all fronts in the winter, which constituted the second stage of the Soviet-German war, with Hitler turning to retreat and the defensive. In this period, after dismissing Brauchitsch, his commander-in-chief, and taking over the command himself, he decided to abandon the plan for an all-out offensive, combed Europe for all available forces and prepared a final offensive which, though limited to the southern front, would, he imagined, strike at the vitals of the Soviet Union. Because it was in the nature of a final offensive on which the fate of fascism hung, Hitler concentrated the greatest possible forces and even moved in part of his aircraft and tanks from the North African battle front. With the German attack on Kerch and Sevastopol in May this year, the war entered its third stage. Massing an army of over 1,500,000, which was supported by the bulk of his air and tank forces, Hitler launched an offensive of unprecedented fury on Stalingrad and the Caucasus. He endeavoured to capture these two objectives at great speed for the twofold purpose of cutting the Volga and seizing Baku, intending subsequently to drive against Moscow to the north and break through to the Persian Gulf in the south; at the same time he directed the Japanese fascists to mass their troops in Manchuria in preparation for an attack on Siberia after the fall of Stalingrad. Hitler vainly hoped to weaken the Soviet Union to such an extent that he would be able to release the main forces of the German army from the Soviet theatre of war for dealing with an Anglo-American attack on the western front, and for seizing the resources of the Near East and effecting a junction with the Japanese; at the same time this would allow the main forces of the Japanese to be released from the north and, with their rear secure, to move west against China and south against Britain and the United States. That was how Hitler reckoned on winning victory for the fascist camp. But how did things turn out in this stage? Hitler came up against the Soviet tactics which sealed his fate. The Soviet Union adopted the policy of first luring the enemy in deep and then putting up a stubborn resistance. In five months of fighting the German army has failed either to penetrate to the Caucasian oil-fields or to seize Stalingrad, so that Hitler has been forced to halt his troops before high mountains and outside an impregnable city, unable to advance and unable to retreat, suffering immense losses and getting into an impasse. October is already here and winter is approaching; soon the third stage of the war will end and the fourth stage will begin. Not one of Hitler's strategic plans of attack against the Soviet Union has succeeded. In this period, bearing in mind his failure in the summer of last year when his forces were divided, Hitler concentrated his strength on the southern front. But as he still wanted to achieve the twofold purpose of cutting the Volga in the east and seizing the Caucasus in the south at a single stroke, he again divided his forces. He did not recognize that his strength did not match his ambitions, and he is now doomed--"when the carrying pole is not secured at both ends, the loads slip off". As for the Soviet Union, the more she fights the stronger she grows. Stalin's brilliant strategic direction has completely gained the initiative and is everywhere drawing Hitler towards destruction. The fourth stage of the war, beginning this winter, will mark the approach of Hitler's doom. Comparing Hitler's position in the first and third stages of the war, we can see that he is on the threshold of final defeat. Both at Stalingrad and in the Caucasus the Red Army has now in fact stopped the German offensive; Hitler is now nearing exhaustion, having failed in his attacks on Stalingrad and the Caucasus. The forces which he managed to assemble throughout the winter, from last December to May of this year, have already been used up. In less than a month winter will set in on the Soviet-German front, and Hitler will have to turn hastily to the defensive. The whole belt west and south of the Don is his most vulnerable area, and the Red Army will go over to the counter-offensive there. This winter, goaded on by the fear of his impending doom, Hitler will once again reorganize his forces. To meet the dangers on both the eastern and western fronts, he may perhaps be able to scrape together the remnants of his forces, equip them and form them into a few new divisions and, in addition, he will turn for help to his three fascist partners, Italy, Rumania and Hungary, and extort some more cannon-fodder from them. However, he will have to face the enormous losses of a winter campaign in the east and be ready to deal with the second front in the west, while Italy, Rumania and Hungary, becoming pessimistic as they see that it is all up with Hitler, will increasingly fall away from him. In short, after October 9 there is only one road open to Hitler, the road to extinction. The Red Army's defence of Stalingrad in these forty-eight days has a certain similarity to the defence of Moscow last year. That is to say, Hitler's plan for this year has been foiled just as was his plan for last year. The difference, however, is that, although the Soviet people followed up their defence of Moscow with a winter counter-offensive, they had yet to face the summer offensive of the German army this year, partly because Germany and her European accomplices still had some fight left in them and partly because Britain and the United States delayed the opening of the second front. But now, following the battle for the defence of Stalingrad, the situation will be totally different from that of last year. On the one hand, the Soviet Union will launch a second winter counteroffensive on a vast scale, Britain and the United States will no longer be able to delay the opening of the second front (though the exact date cannot yet be foretold), and the people of Europe will be ready to rise up in response. On the other hand, Germany and her European accomplices no longer have the strength to mount large-scale offensives, and Hitler will have no alternative but to change his whole line of policy to the strategic defensive. Once Hitler is compelled to go over to the strategic defensive, the fate of fascism is as good as sealed. From its birth, a fascist state like Hitler's builds its political and military life on taking the offensive, and once its offensive stops its very life stops too. 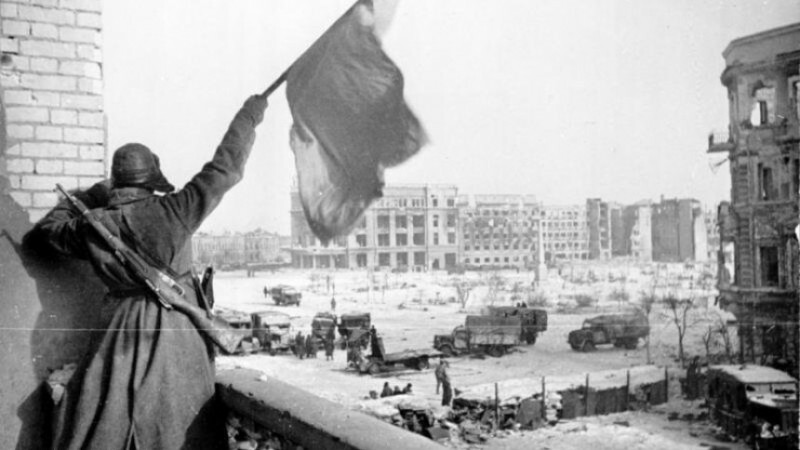 The Battle of Stalingrad will stop the offensive of fascism and is therefore a decisive battle. It is decisive for the whole world war. There are three powerful foes confronting Hitler, the Soviet Union, Britain and the United States, and the people in the German-occupied territories. On the eastern front stands the Red Army, firm as a rock, whose counter-offensives will continue through the whole of the second winter and beyond; it is this force which will decide the outcome of the whole war and the destiny of mankind. On the western front, even if Britain and the United States continue their policy of looking on and stalling, the second front will eventually be opened, when the time comes to belabour the slain tiger. Then there is the internal front against Hitler, the great uprising of the people which is brewing in Germany, in France and in other parts of Europe; they will respond with a third front the moment the Soviet Union launches an all-out counter-offensive and the guns roar on the second front. Thus, an attack from three fronts will converge on Hitler--such is the great historical process that will follow the Battle of Stalingrad. Napoleon's political life ended at Waterloo, but the decisive turning point was his defeat at Moscow. Hitler today is treading Napoleon's road, and it is the Battle of Stalingrad that has sealed his doom. These developments will have a direct impact on the Far East. The coming year will not be propitious for Japanese fascism either. As time goes on its headaches will grow, until it descends into its grave. All those who take a pessimistic view of the world situation should change their point of view.